FARMINGTON, June 1 – Brigit Hogan scored a school-record 65 goals to help lift the Farmington High girls lacrosse team to its second straight CIAC state tournament berth and its first-ever league championship. With a two-goal win over Southington on May 22 and a 14-5 victory over Berlin on May 24, Farmington (13-3, 5-0) finished undefeated in the CCC South. The Indians dropped a non-league contest to Windsor on opening day by one goal but in the conference bout, it was Farmington that earned a one goal victory, 12-11. 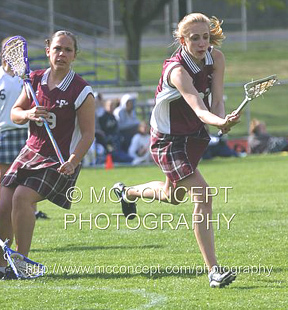 FARMINGTON, June 1, 2010 – For the second time in the team’s history, the Farmington High girls lacrosse earned a spot in the CIAC tournament. The Indians went 7-9 to earn a berth in the CIAC Division II tournament. But Trumbull ended Farmington’s tournament with a 17-2 victory in the first round. Under first-year head coach Jeff Manaresi, Farmington (7-10, 1-4 CCC South) scored a team-record 173 goals this season, led by Heather McElroy with a team-leading 36 goals and eight assists for 44 points. 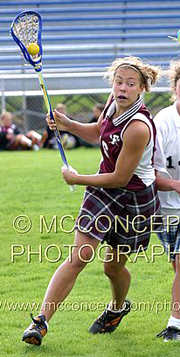 Caroline King added 27 goals and 14 assists for 41 points. Bridgit Hogan scored 28 goals and with six assists, she had 34 points. Other top scorers included Kaitlyn Murray (17-9, 26) and Morgan Beaupre (11-8, 19). Farmington began the season by winning three of its first four games with wins over Morgan, Canton and Housatonic. Other key wins came with a 15-9 victory over Berlin and a 12-7 win over East Catholic on Senior Night. Farmington posted its only shutout of the season with a 15-0 win over Housatonic with six goals from McElroy to clinch a spot in the Division II tournament. FARMINGTON, June 1, 2009 -- In its first season in the Central Connecticut Conference, the Indians went 6-10 overall and 1-7 in the league. Their only league victory came in the season finale against Windsor, 15-13. Glastonbury won the CCC title with a perfect 8-0 record followed by South Windsor (7-1) and Hall (6-2). Schweighoffer was the lone FHS athlete to earn All-CCC honors. Next spring, Farmington will play in the CCC South with Southington, Windsor, Newington, Berlin and East Catholic. FARMINGTON -- For the first time since the program took the field as a varsity program in 2000, the Indians will have a league championship to shoot for. Farmington will begin play in the Central Connecticut Conference after the school joined the CCC last fall. RIDGEFIELD, June 4, 2007 – After a two-week layoff, No. 7 Ridgefield burst out of the gate with a 10-1 surge and led by 11 goals at halftime (13-2) to beat No. 10 Farmington, 19-7 in the first round of the CIAC Division II tournament. It was the first post-season appearance for the Indians (10-7). Unselfish play carried the Tigers, who hadn’t played since the end of the FCIAC regular season. They didn’t qualify for the FCIAC Tournament. "This was one of the best games we've played all season, working as team together," Ridgefield coach Lloyd-Williams told the Danbury News TImes. "We're all psyched to be in states because we didn't make FCIACs so this is a big deal for us. We've been working hard in practice and it's beginning to show.” Farmington junior Kaylin Berger scored four of her team's seven goals to finish the season with 50. GOALS: Ridgefield: Melissa Lloyd-Williams 5, Lauren Flood 3, Sam Ohrem 3, Alexa Darling 3, Jocelyn Kuchta 2, Jeanne Donovan, Theresa Donovan, Kristina Baker. Farmington: Kaylin Berger 4, Allana Morawski 2, Meghan Murray. ASSISTS: Jeanne Donovan 6, Alexa Darling 2, Kuchta, Ohrem. SAVES: Jenna Ruddock (R) 8; Amanda McKeon (F) 11. 6-10, 1-7 CCC. Glastonbury (8-0) won the league championship. Schweighofer made All-CCC team. Conard (3) -- Kay Berger 3.